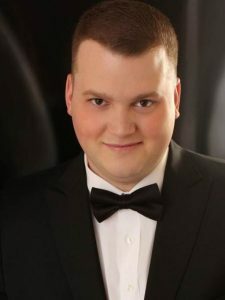 Anthony Clark Evans, a baritone (OIO 2008) has been busy this past year. Last April he sang Sharpless in Madama Butterﬂy for the San Diego Opera, and then spent part of the summer with the Opera Theater of St. Louis as Marcello in La bohème. In the fall he repeated Sharpless for the San Francisco Opera, then sang Lovec in Rusalka for the Metropolitan Opera. In June he competes in the famed BBC Singer of the World competition in Cardiﬀ, Wales, and in February he takes on Sir Riccardo Forth in I Puritani with the Lyric Opera of Chicago.